The Legend of Zelda: Link's Awakening is the first Zelda title for a handheld. It was released in 1993 for the Gameboy and a colour version was released in 1998 for the Gameboy Color. TLOZ:LA is the fourth game in the Zelda series after two NES and one SNES installments. The game takes place on the island Koholint. After a shipwreck, Link finds himself stranded on the island. He is being told that on top of a mountain is a giant egg in which a creature called the Wind Fish lives. The Wind Fish is said to be the guardian of the island. In order for Link to escape from the island, he has to wake Wind Fish. To do this, Link needs eight musical instruments, which he has to retrieve by beating the dungeons on the island. The gameplay of TLOZ:LA is very similar to the other non-3D games in the series. It features a top-down perspective; Link must beat dungeons to reach the end; many items have to be found and used to advance in the quest; there are a number of side-quests besides the dungeons. Throughout the game pieces of heart are hidden. When four pieces of heart have been found, a new heart container is added to the life bar. A thing that make TLOZ:LA stand out is that it features 2D platform action in some dungeons. Another major difference with most Zelda games is the absence of the land Hyrule, Princess Zelda, the Triforce and Ganon. Instead the story and events are rather independent of the other games in the series. 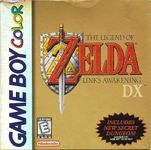 The Gameboy color-port of the game, The Legend of Zelda: Link's Awakening DX, features full colour graphics. A new optional dungeon, the Color Dungeon, has been added as well. Many puzzels in this dungeon are color-based. Completing the dungeon gives the player the choice between two advantages which are not required to complete the game. Several other minor changes have been made to the game as well. TLOZ:LA was well received when it was released. At the time of its release it was one of the biggest adventures ever on a handheld. The two major criticisms were both inherent to the Gameboy platform. The first was the lack of color. The second was the limitation of two buttons for items. The game lets the player assign items to both the A and B button. Since many different items are used all the time, a lot of item-switching is needed, which can become an annoyance.